3800 Collection Grade 1 Escutcheon Mortise Keyed Entry Door Lever Set with Stainless Steel Trim. The Hager 3853 escutcheon mortise keyed entry lock features a latchbolt that can be retracted by lever from either side unless the outside is locked by 20- rotation of thumbturn. The deadbolt is thrown or retracted by 90- rotation of the thumbturn. When locked, use of a key outside or the lever inside retracts deadbolt and latchbolt simultaneously. The outside lever remains locked until thumbturn is restored to vertical position. Throwing the deadbolt automatically locks the outside lever. An auxiliary latch deadlocks latchbolt when the door is closed. Hager 3800 Series mortise lock provides maximum security and durability for the harshest environments. 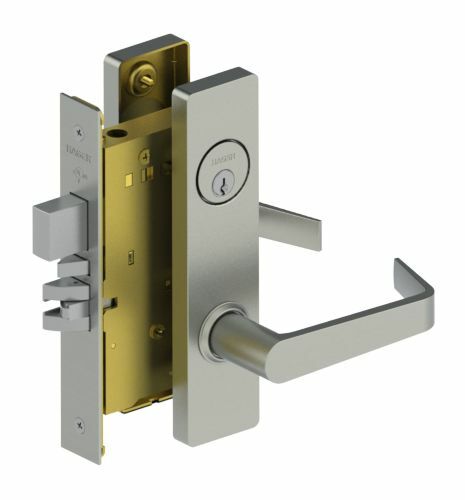 With field reversible handing, ease of installation, and both escutcheon and sectional models available, the 3800 Series lock provides great flexibility. What" s more, it is ANSI certified Grade 1 Operational and Security and is backed by a lifetime warranty. Breakaway spindle design prevents damage to the lockbody. Stainless steel cylinder collar prevents wrenching. Self adjusting case for beveled doors.1" Throw Stainless Steel Deadbolt. 3/4" Throw Stainless Steel Latchbolt. BHMA Certified ANSI A156.13 Grade 1 Series 2000 Operational and Security. ADA Compliant ANSI A117.1 Accessibility Code. UL/cUL Listed for all functions up to 3 hours for " A" label doors. 3-5/8" Center, Cylinder to Spindle. 2-7/16" Center, Thumbturn to Spindle. Lock case: 4-5/16" x 6" x 1" 1" Throw Stainless Steel Deadbolt. 1-3/8" to 2-1/2" Steel Door Thickness; 1-3/4" to 2-1/2" Wood Door Thickness.